By the name of Allah, the Compassionate, and the Merciful. All our praises and glorifications is for Allah, the lord of the worlds. May His peace and blessings be upon our Prophet Mohammad, his family and his companions. May Allah (c.c.) bless our Sheikh, guide and spiritual trainer Shahid-ul Haramain and raise his maqam. May Allah be pleased by all His good servants and let us stand with them and show us mercy under the flag of our beloved Prophet. My dear brothers and sisters, I embrace you with a warm feeling bursting in my heart, my heart that is full of longing for this kind of meetings and I say welcome to you all. I am grateful that Allah the Almighty let us meet here and honored by with the opportunity to talk to you. You came here, to this commemoration program that is very important to us and has a special place in our hearts. You gathered here to reminisce about our guide Shahid-ul Haramain, our beloved Sheikh who left deep engraved a lasting impression in the hearts of every follower who lived with him, who left beautiful memories in the hearts of his loyal friends after he passed away. My dearest brothers and sisters, after his physical presence left us, we, as his followers, miss him very much. Many wise scholars miss him. Pure believers whose ultimate purpose is to gain the mercy of Allah miss him. Yes, he is not physically between us anymore; however, the path he built will always remain shining for us and the next generations. His light will keep enlightening the ages and will show the right way to those who are looking for it. Yes, we lost such a majestic person physically; but his principles will remain alive in our hearts, will keep existing in the heart of every follower and in the lives of his true friends. May the peace of Allah be upon that pure soul on the day he was born. May the peace of Allah be upon that soul who invites the people to goodness, beauty, love and salvation. May the peace of Allah be upon that pure soul who accepted the invitation of his Lord and passed on into eternal life. And be the peace of Allah be upon him on the day he will be born again. My Muslim brothers and sisters, – may the peace and mercy of Allah be upon him – our Sheikh spent his glorious life on the way of Allah. He lived a life that represents the true, crystal, strong and clear essence of Sufism that is purified from bid’ahs, superstitions and religious contradictions; he spent his life on the path of Naqshibendi-Haznavi sect that is the same way with our prophet?s way, inviting people to the right path. Yes, these principles and policies represent the true Sufism that aims to unite people in the way of Allah and keep them connected to Him. Therefore, a person will become and a true and loyal Muslim; will aim only the mercy of Allah and will adopt the ethics of our Prophet. Our Sheikh was trying to gather people, unite their hearts and spread love between them during his glorious life. May Allah be pleased with him. Our beloved Sheikh told people the beauties of the deen, explained the main principles of Islam with his sincerity and ikhlas. Yes, honorable Muslims, the religion of Islam is not the religion of oppression, fighting, chaos and evil; it is the religion of goodness, beauty, friendship and ikhsan. I swear in the name of Allah that, my brothers and sisters, the peace we are trying hard to obtain and wish to realize is only possible in Islam. We can be happy only by becoming and keeping attached to our religion. It is not possible to have peace or happiness without turning to the deen of Allah. My Muslim brothers and sisters! There is not one person who is not looking for happiness in this world; everyone wishes and hopes to live a happy life. However, we need to catch any one of them; man or woman, rich or poor, old or young; anyone of them; and ask if they are happy or not, what do you expect their answers to be? Yes, the answer will mostly be ?No!? Then, what is the reason that we all lost our happiness? What is it that disturbs our peace and happiness? Why are so many people unsatisfied with their lives? Who are Muslims are in grave troubles and chaos today, my brothers and sisters? Yes, my brothers and sisters! If we think that we will have peace and be happy by acting as our nafs wish, committing sins and abandoning the commands of Allah, we are extremely wrong. Our situation is just like a person who is craving for water in the severe summer heat and hopes for a help from a mirage in the desert, who runs after it thinking that it is water but finds nothing when he gets there. In this case, he finds Allah and gets treated according to his actions. My brothers and sisters, today everyone is complaining about their state. They have no peace, they live an irregular life. Yes, we started to see the examples of this a lot nowadays. It is frequently encountered. Today, despite of their extraordinary material welfare and civilizational progress, people are in fear and pain. The occurrence of neural and psychological problems is increased a lot. The humanity is in a great depression. I swear in the name of Allah, my dearest brothers and sisters; the only reason for all of this is that they got away from the path of Allah. The reason for this is the weakness of imaan in our hearts; the reason is that is they are empty of true imaan and submission. Just like human body needs some certain food and they get sick and die when they are not supplied with it, soul also needs some certain nourishment; it gets seriously depressed when it loses hem. It gets stuck in chaos, sorrow and desperation; it sinks deep into depression and gets captivated by delusions and illusions. The food of our souls, my dear brothers and sisters, is to hold firmly on the rope of Allah and be committed to everything that our beloved Prophet Mohammed brought from his Lord. The nourishment of the soul is the belief in Allah. The nourishment of the souls is to be alone with Allah, benefit from Holy Quran and love to pray to him. Therefore, my brothers and sisters, because the valuable sheikhs of our sect -May Allah enable us to benefit from their abundance and barakah-, our masters, were willing to transmit the goodness and beauties to their followers, for they wanted their followers to live a happy life very much, they made the zikr done by heart the main principle of their sect. In this way, the follower will spend all of its time with zikr and fire the blindness from his or her heart. Hence, a follower who follows the commands of the great sheikhs and masters of our sect and keeps his or her virds and zikrs with loyalty and ikhlas will undoubtedly obtained the happiness in this world and in the next one. I heard my Sheikh father (k.s.) saying: ?One day, Ibrahim ibn Edhem, who was an ascetic servant of Allah, a pious Sufi who did not eat anything except some breadcrumbs, was sitting next to a river. He was holding a piece of bread and there were some Sufi friends of him with him. He was softening the bread he was holding with the water of the river and drinking the water with his hand. He called on his friends: ?By Allah, we are living such a happy life that if the kings were aware of that, they would wage war against us to take it from us. Then, my brothers and sisters, in contrast to many people think, happiness is not about property, wealth, children and post. No, no, my brothers and sisters, the way to true happiness is about occupying the heart with divine remembrance. Is the heart is full of zikr, its owner will be happy. In short, the happiness can be found in devotion to Allah and doing good deeds. Happy person is a person who knows the value of the life, spends his or her time with good deeds and ibadah, stays away from the things that Allah forbids, realizes his or her failings and fixes them before the death catches and makes him or her regret it. This is the definition of a happy person, my brothers and sisters. Honorable Muslims! By Allah, whatever with the first generation of our ummah finds the truth will be the medicine of the today’s ummah, too; there is no other cure. In other words, whatever it was that brought the ummah to the highest zenith and to the best achievements of the civilization, it is also what the salvation depends on today. Yes, the truth that brought them to the highest point of the civilization that they were their commitment to their deen. Honorable Muslims! Today, we need to learn the main teachings of our deen more than ever. What else can be the reason for this confused, miserable and dispersed state of ummah was that it has gotten away from its deen and became ignorant of the teachings of it? Therefore, our duty is to hold firmly on the rope of Allah and return back to the path of our Prophet. It is because the only way to be saved is this! There is no other way to have victory and salvation. Besides; we definitely need mutual love and compassion. 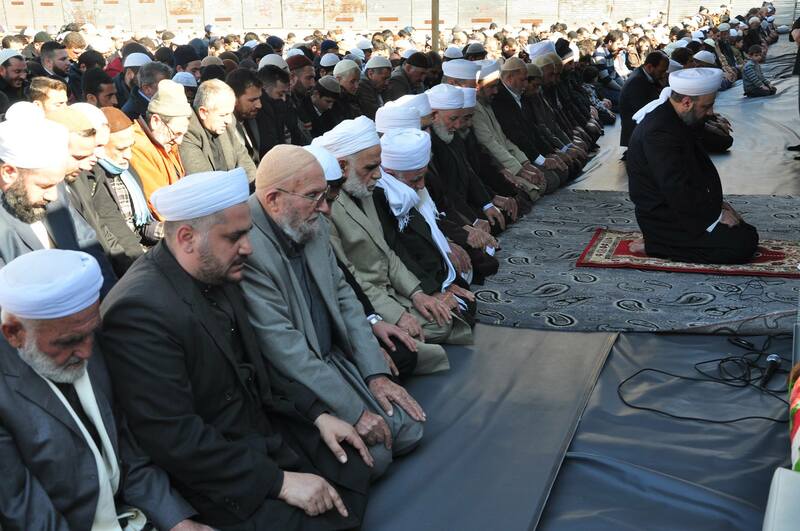 We need solidarity, cohesion and obtain the ethics of our beloved Prophet. We gain hearts with ethical living and virtuous behaviors and make them love Islam. By getting closer to each other and getting united, we can block the way of ill-intentioned people who does not wish anything good for the ummah of Islam and Islamic countries. Now, my brothers and sisters, I like to draw your attention to some of the important issues that I explained in some of our meetings by repeating and emphasizing them: my brothers and sisters! My Sheikh father was saying in most of his preaches: the foundation and stance of Haznavi sect is completely religious. We have nothing to do with politics and -thanks to Allah- do not collect or accept the money of people. If there is someone using our name and trying to deceive you, whatever his position and relation to us; a follower or a scholar or a person from Haznavi family, or as our in Sheikh?s words, even if he is my brother or son, I am not with him. I have no connection with him. My grandfather Sheikh Izzettin Haznavi also repeated this matter in his meetings with the common people and emphasized it. Today, I, who am put under a heavy duty by my father, assigned to the hard responsibilities of Haznavi sect after him, I beg to Allah and ask you to pray that may Allah the Almighty provides me with the sufficient power to carry this burden and allow me to be worthy of the trust of our Sheikh and yours my Muslim brothers and sisters! I, this poor servant, testify the path of my beloved father and other sheikhs of past and say: the family of Haznavi has grown; branched out and spread to everywhere. Some members of it settled down in Turkey or other countries. I like you to know that not every person who carries the name of Haznavi is the representative of Naqshibendi-Haznavi sect. If you see a person who carries the name of Haznavi and uses it for his personal interest, please know that he is representing only itself. It has no connection to the family of Haznavi. We are away from his attitudes and behaviors. Please, I ask you to explain this situation to other people who are not here. Lastly, I like to thank you all for your participation to this meeting. May Allah be pleased by everyone who has a part in the organization of this remembrance program by any means. I ask Allah the Almighty to grant you with success, ikhlas and forgive your sins. May Allah remove all the troubles that our country and other Islamic geographies are facing. May he revoke all the problems. May His peace and blessings be upon our Prophet Mohammad, his family and his companions. Al-Fatiha.